I wanted to wait to publish this week’s post, so it coincided with Thanksgiving. It’s a proper time to give thanks to those around me. Also, it’s a good time to reflect/ appreciate experiences to shape my entrepreneurial journey. Published Postmortem of a Failed Startup: Lessons for Success. Started 100 Strangers, 100 Days. Read six books with subjects ranging from sales to leadership to personal development. Upped my yoga game, practicing at a legit yoga studio. Maintained good strength and development in the gym. My SalesWise team. Joined them at the beginning of this year, and we’ve been through a lot with our pivots. However, we’re getting some good traction now, and we’ve learned a lot. We’ve poured a lot of effort into the company. We’ve also had fun doing it. Meanwhile, the team has trusted me to do a lot. They’ve continued to put their faith in me to do right by them. Infinity Yoga — that “legit yoga studio” I mentioned earlier.They were recently named one of the Best Small Business by Mindbody, and it’s easy to see why. The community at the studio is special. The culture cultivated by Becky (owner) and the other yoga teachers is amazing, and I’m proud to be a part of it. It’s why no matter how busy I get, I make time to end many weekdays at Infinity. Oh, and yes, the yoga teaching is top-notch. Communities at Atlanta Tech Village and Starbucks. Atlanta Tech Village is a great place to connect with like-minded entrepreneurs. They’ve been there, done that, or are doing that. Starbucks, meanwhile, continues to broaden my circle of people from all walks of life. It may be a local Starbucks, but the people who walk in and out of the doors are anything but “local”. My close friends. You know who you are. Many of you were editors for my book. Many of you have attended my speaking engagements to support me. Many of you “stop by” (via random texts, emails, etc.) to just say hello and see what’s happening. The little events are what make a big difference. Spending hours or minutes with people is great. But even a few seconds to say you’re thinking of me or have a question is precious. My oh-so-many new friends. I’ve met so many people (beyond the Strangers) who continue to shape my day-to-day. I meet them at ATV, at Starbucks, etc. It’s an amazing feeling when you see these new and old friends. They always manage to bring a smile to my face no matter what. When they flash a smile, I can’t help but do the same. Smiles matter. My family. Hard to say anything without my family, right? They’ve always been there to also pull me out of my work and alone time. My niece is growing so fast, that it’s been beautiful to watch. Many more thanks to give, I’m sure, but that’s where I’ll start. Happy Thanksgiving! If you’re an avid fan of the show Big Bang Theory, you might recall an episode when Sheldon describes Leonard and Penny’s relationship potential using Schrödinger’s Cat. In the episode, Sheldon uses the thought experiment to motivate Penny and Leonard to make a decision about going on a date. Schrödinger’s Catis a thought experiment developed by Austrian physicist Erin Schrödinger. In simplicity, the experiment proposes a cat in a box with a poison which can be exposed or not depending on another factor and left for an hour. During the hour, the cat is in a state of “quantum superposition” – that is, the cat may be both dead and alive. Only if the box were opened would someone discover if the cat is dead or alive. I thought about this experiment when I took an alternate route to Atlanta Tech Villagethe other day. The route wasn’t better than my usual, but it let me lay to rest the “what if?” This is a similar principle behind entrepreneurship – testing hypotheses, learning, and executing the next plan. We all have thoughts about the “what if” much like we have ideas of The Next Big Thing (please don’t sue me, Samsung) – we’re all creative and start out as “wantrepreneurs”. What changes someone from wantrepreneur to entrepreneur is execution – “opening the box”. What ideas do you have that you’ve been wondering the “what if”? What stops you from experimenting? They were very enthusiastic about meeting, and before entering, I thought we’d talk about their project and what I’m doing… general first-date talk. But instead, it quickly became a “please help fix this bug!” session. After ~30 minutes of studying the code, I was able to solve their issue. They were so excited because they had been stuck for over a month! They have an office at Atlanta Tech Village. In a startup co-working space with the tagline “Engineered Serendipity”, entrepreneurs are surrounded by lots of technical talent. Finding help shouldn’t be hard. Of course, you need to ask for help. As entrepreneurs, we have egos; so doing things ourselves can be the preferred route. However, we’re obviously not good at EVERYTHING, and it’s well worth our time (speed is key in startups!) to ask help from the experts. If you’re starting a technology company, know technology; or at the minimum, have a technical team member.Substituting your team with outside, paid resources in lieu of long-term technical talent is a big risk – especially should he/ she leave, like the situation here. Help comes from everywhere, not just the startup world. I met our mutual friend from Starbucks, and she, aside from us, does not have connections to the tech startup community here. Yet, she knew her friends needed help, so introduced us. Entrepreneurs and others alike would do well to ask for help more often and build up a diverse support network to augment their “shortcomings”. Where have you received help from someone you didn’t expect? What did you do to get connected with others to either give help or receive help? 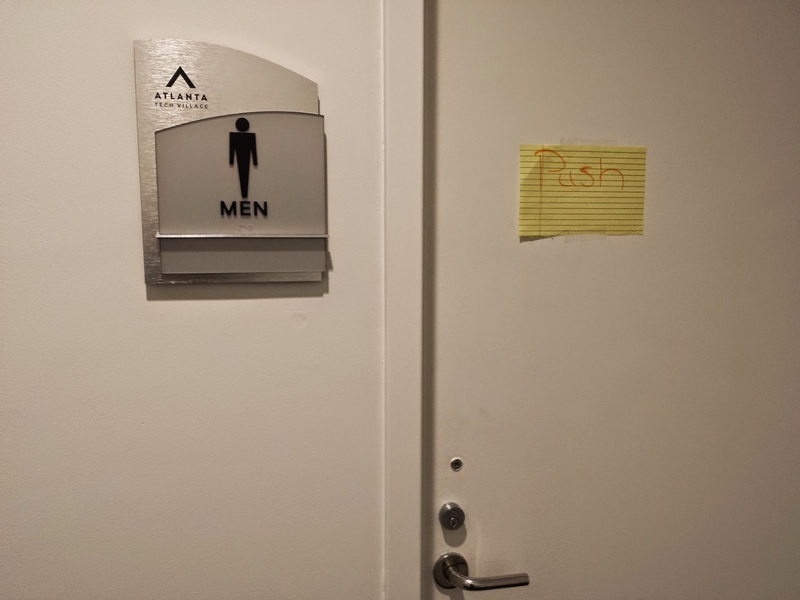 I don’t have a thought-provoking post today, but instead, I’m going to share a few pictures I took of the door to the men’s bathroom at Atlanta Tech Village back in January. Why? Because in the spirit of entrepreneurship, 1) I think these pictures are great representations of user experience not matching its intended design and 2) lean startup methodology for a short-term resolution. 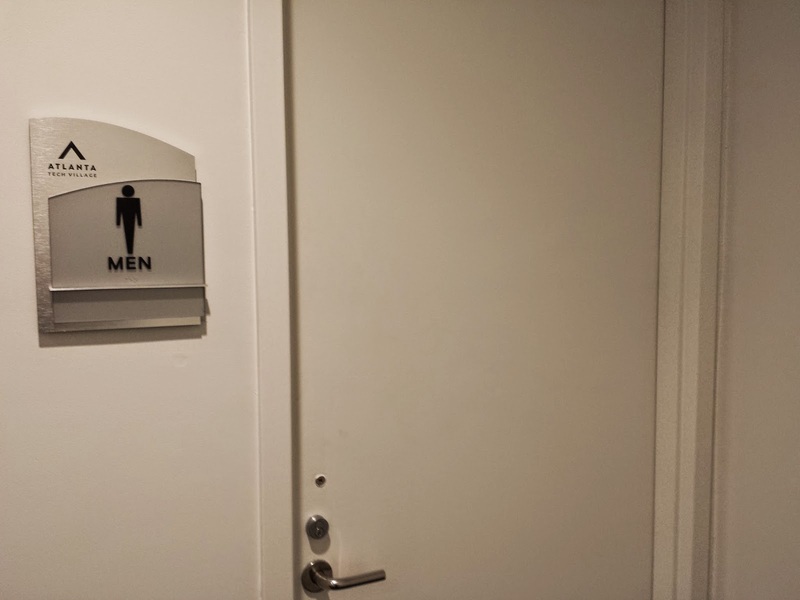 So the first picture here is of the door leading to the bathroom on the first floor. Looks pretty simple and straight forward, right? Except, it’s not. Yes, a door knob. Except, when you go to turn it, it doesn’t turn. 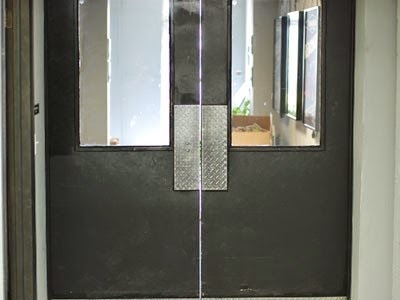 So, it’s pretty common to see people walk up to the door, attempt to turn it, find it “locked”, and either wait for someone inside to open (thinking someone’s inside), or leave altogether. Upon closer inspection, the door jam is stuffed with paper. 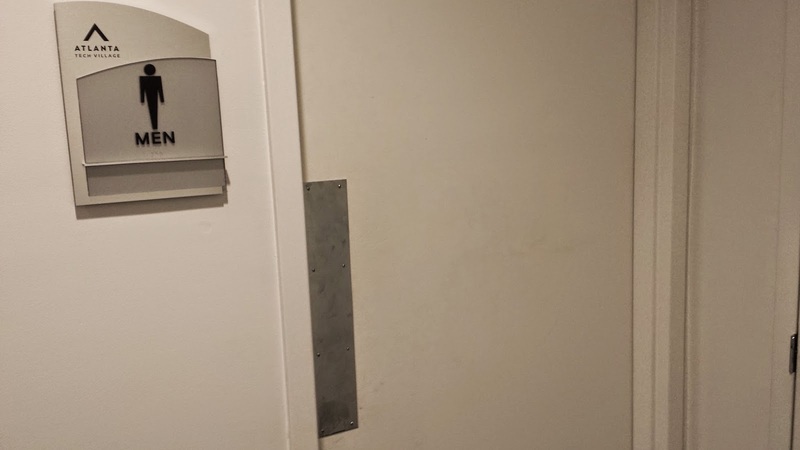 Instead, this door is meant to be pushed [from the outside]. 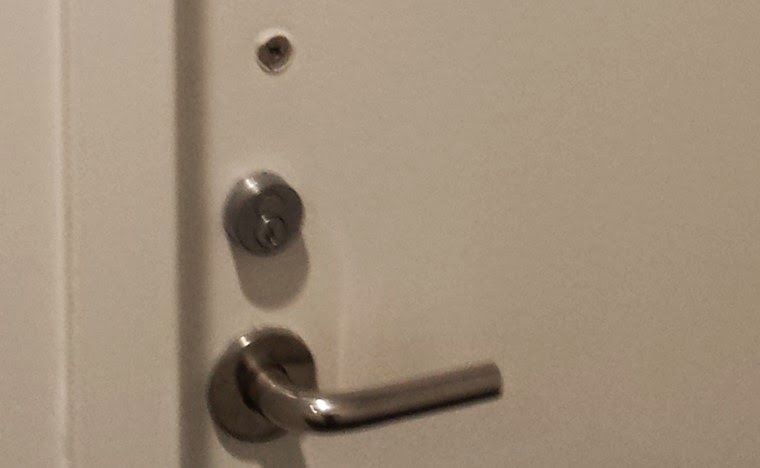 See, this door knob is really arbitrary, and actually, it’s misleading. Here’s an example where design and engineering aren’t matching. I don’t have a picture of the door since January, but I’ll update this post after Friday when I stop by ATV to see what’s changed. Last I remember, it hasn’t quite changed. Instead, I’ve just gotten used to ignoring the door knob and pushed through. So the point here is really very simple: design simply and ensure user experience matches the design you intended. Sure in this example, users can get upset or worse have a kindergarten accident (hopefully not likely). But in today’s technology world, we as entrepreneurs, designers, and builders sometimes do not get second chances before users dump our app or SaaS in favor of a simpler, accurate, and engaging user experience. Also, sometimes the most effective solution is really a lean startup-like solution in the short-term. 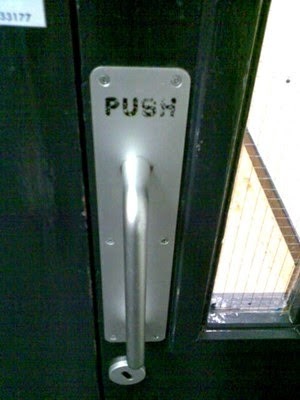 In this case, a simple note taped to the door notifying the user to “Push” is sufficient for now. 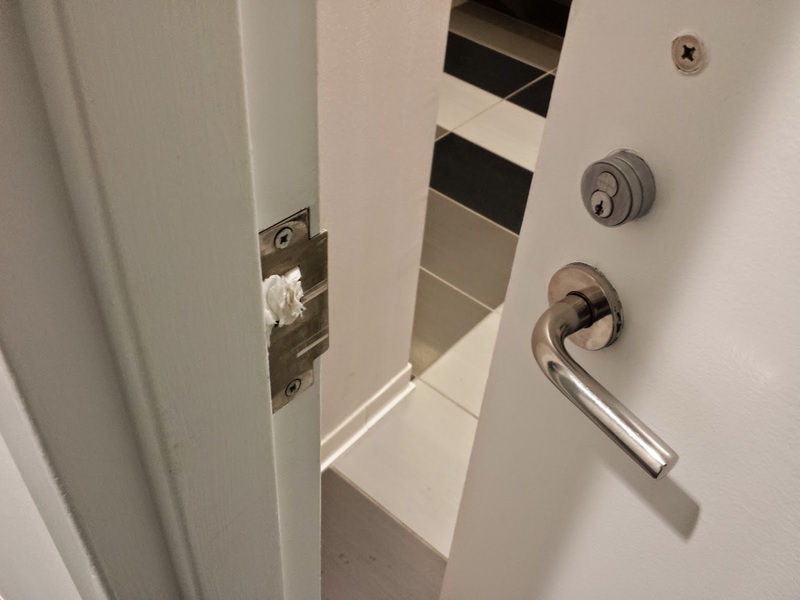 Most people will overlook the tackiness of this approach before you can actually replace the whole door knob in favor of one of the “Push” handles later.